Jodie has made such progress and now has a part time job. Jodie came to us and completed a 30 hour course at Level 1 called “Developing Personal Confidence and Self-Awareness”. 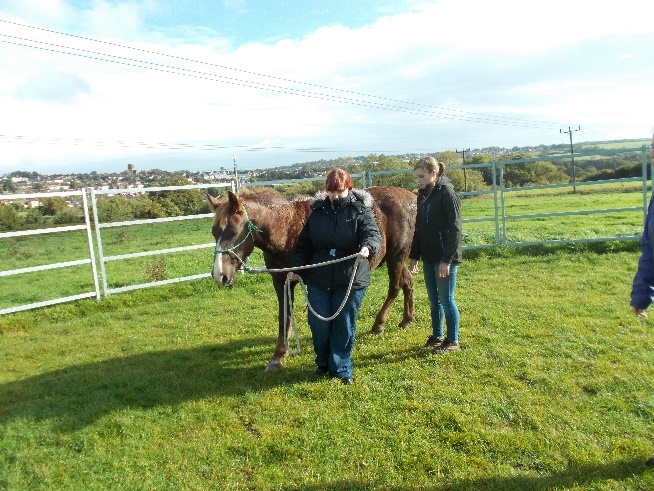 She contacted us as a result of seeing our advert for this course and sent us an email stating that “she was 24 yrs of age and struggling with anxiety but that she had a love of animals”. She also had a fear of being around groups of people and so was worried about travelling. However she rang and spoke to Giles and managed to get the bus to Tescos in Ryde where Giles collected her by car and brought her to the yard each week. As a result of overcoming her initial anxiety she managed to attend sessions at Bodster C.I.C. During the course she began by working with 1 person and eventually a small group of other learners as her confidence grew. She also initially was very wary of the ponies but again as her confidence grew she developed her skills. Prior to coming on the course she had enjoyed helping out at a pre-school but had lost her confidence. As the Bodster course progressed Jodi became able to learn small tasks which she then became able to teach to her peers. On some weeks she would ‘phone us to say she had missed the bus because she had woken up worried. She would manage to text us and we would reply and encourage to get the next bus which she would do. She would sometimes feel dizzy due to her anxiety and on occasions when she finally arrived at Bodster for the session she needed time to just go and watch the horses to calm down. She often would tell us how at the end of each session she felt so much better than at the beginning. So Jodi managed to complete the whole course and achieve a Level 1 qualification. She then gained sufficient confidence to apply for a new position in a pre-school and kept in touch with us after completing the course. She rang prior to her interview to say she was nervous of going on the bus to the interview. However she did manage to do so. She in fact now works part time at Greenmount Pre-School and recently came back to see us to tell us how well she was doing. For Jodi coming on this course at Bodster CIC has had a major positive influence and has opened up this new job opportunity for her which prior to coming on the course she would never have even tried.